This revolutionary desk chair will change the way you sit. 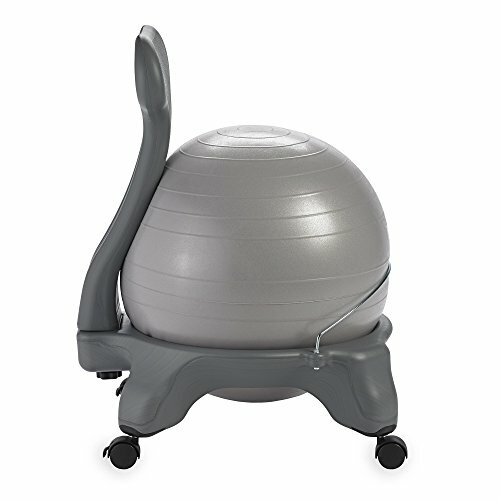 Designed with a work-life balance in mind, the Gaiam Balance Ball Chair, created with the help of chiropractic pioneer Dr. Randy Weinzoft, provides the all-day ergonomic support needed while sitting for long duration. Feel better at your workplace by utilizing this alternative chair solution that encourages wellness and helps to soothe the aches and pains that come from sitting at a desk for extended periods of time. By promoting micro movements and constant stimulation of the body, the mind will experience a heightened sense of focus and concentration. This unique office desk chair is designed for users between 5' - 5'11" and fits most standard size desks. For users that may require a little extra boost, the Gaiam Leg Extenders add 2 inches of height to your chair. Please note that for the ball to fit perfectly in the base, it may be necessary to re-inflate the ball once or twice after initial inflation. INFLATION INSTRUCTIONS: It may be necessary to re-inflate the ball after initial inflation to allow the ball's material to stretch to its final size. Inflate ball with air, let stand for 24 hours, deflate 50% then fill again to 52cm height. Gaiam Adjustable Balance Ball Stool, Stability Ball Swivel Chair for Standing and Seated Desks in Home or Office, Black 33"